This is the 4th of 52 weekly posts planned for 2018. It was inspired by the #52Ancestors writing challenge issued by professional genealogist, Amy Crow Johnson. The challenge: once a week, for all 52 weeks of the year, write about a relative in your family tree. This week we have another relative who seems to have disappeared from the history books, though she lived to be 71. Agnes E. Grzeskowiak (pronounced gresh-KO-viyak) is my 2nd great aunt. She never married and had no children. Information about her during the three decades between 1940 and her death remain elusive. This is what is known of her story. Agnes Grzeskowiak was born on November 29, 1898 in Detroit, Michigan. She was the youngest of 12 (possibly 13) siblings. Her parents were Albert Grzeskowiak (1849-1931) and Agnes Szaroleta (1854-1918), both immigrants from Poland. They came to the U.S. in the 1880s and settled in Detroit. 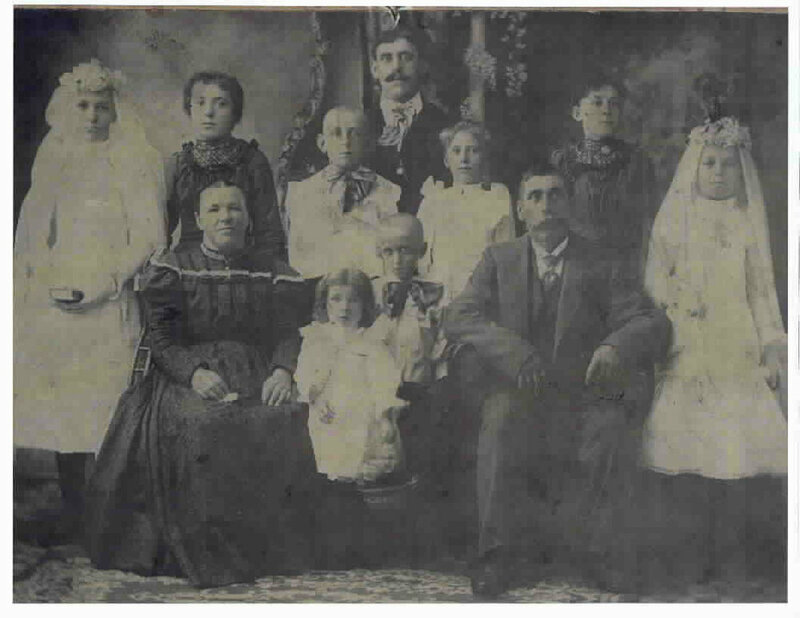 Here is the Grzeskowiak family, probably sometime between 1900 and 1905. As the youngest it seems likely that Agnes is the little girl standing in the front row, between her parents. My great grandmother, Marianna Grzeskowiak Pawlowski (1879-1941) may or may not be one of the older girls in this photo. Marianna was married in 1903. I connected with a 2nd and 3rd cousin who share my Grzeskowiak roots. One of them had the following photograph. It was said to be taken in 1920 at the wedding of Anthony Grzeskowiak (1892-1944) and Helen Szpunar Grzeskowiak (1895-1971). Anthony (center) was Agnes's older brother, making him my 2nd great uncle. The bridesmaid on the right is identified as Agnes Grzeskowiak. The man on the right and the woman on the left are unknown. I am working on clearing up some confusion about the man on the left, who was identified as a Chester Stuve. Agnes would have been about about 22 when this photograph was taken. 1930: 1315 Canfield Ave. (this was the same 339 Canfield house as before, but the Detroit addresses were renumbered sometime after the 1920 census). She is listed as living with her father, Albert, at 1315 (rear). Her brother, Casimir Grzeskowiak was living in the front of the house with his family. Agnes's father, Albert, died in 1931. Interestingly, living at the same address (1315 rear) by herself in 1940 was a "Maria Grzeskowiak." Though I have never seen her name listed as Maria, this most certainly has to be her. Agnes had also changed her name to "Graskey" or "Greske" as had her brother, Casimir, who was still living at the front of the house. 1940 was also the first year that Agnes was listed as having an occupation: Cigar Maker. Since the census records after 1940 are not yet available I can't be sure how long Agnes lived at that address. The next step would be to check the Detroit city directories. The next documented evidence of Agnes's existence only came in the form of her obituary in the Detroit Free Press on January 7, 1970. I also have her funeral prayer card. Agnes is buried in the Grzeskowiak family plot at Mt. Olivet Cemetery in Detroit. I paid a visit to Mt. Olivet a year or two ago and took some pictures of the Grzeskowiaks (and others) that were there. Here is a closeup of Agnes's stone that simply reads "Dear Aunt". Where did Agnes go between her last known address in 1940 until her death? I've searched several newspaper clipping sites and have found no mention of her. The most likely source of personal first (or second) hand knowledge about Agnes probably rests with any of the descendants of her brother and neighbor, Casimir Grzeskowiak (1893-1960). I have not made contact yet with this branch of my tree, but I hope to. Casimir and his wife, Marie Wanalek Grzeskowiak (1910-2002), had two sons that I am aware of. As I think about Agnes and my family tree I am reminded of the mission of The Psychologenealogist: Exploring the spaces where psychology, genealogy, and history converge - one story at a time. Where did Agnes live after 1940? What cigar factory did she work at? Where was she living and with whom at the time of her death? Did Agnes ever consider marrying? Was she expected to take care of her father until he died? What does it feel like to be the last of your siblings surviving, especially if you don't have an immediate family of your own? Was she close to any of her nieces and nephews? My great grandfather, Adam Pawlowski (1879-1959) was known as “Dziadzio” by my mother and her generation. He was a quiet man, perhaps because he spoke little English. His hands seemed permanently yellowed from cigarettes and he had false teeth that he kept in a glass next to his bed. This is his story. Agnieszka “Agnes” Szaroleta Grzeskowiak (1854-1918) was my 2nd great grandmother. She was married to my 2nd great grandfather, Albert Grzeskowiak (1849-1931). They came to the U.S. from Poland in the early 1880s and settled in Detroit, MI. My 1st cousins, 2x removed, Chester Joseph Stuve (1913-1978) was "A good-natured fellow, an enthusiastic athlete, and a diligent student." Apparently his also had a strong neck. Here is his story as told through yearbook photos. Pneumonia was one of the leading causes of U.S. deaths in the early 1900s. It took the life of my 2nd great aunt, Francisczka “Frances” Grzeskowiak (1886-1905). This is her story. Dolores Urkowski is my 2nd cousin once removed. Tragically, she witnessed the murder of her 20 year old nursemaid, Jennie Zablocki, in 1933. This is what I know of the story. My first cousin twice removed, Edward Pawlowski (1905-1907), died on Valentine's Day in 1907. He was one year, four months, and nine days old. This is his story. Agnes E. Grzeskowiak (pronounced gresh-KO-viyak) is my 2nd great aunt. She never married and had no children. Information about her during the three decades between 1940 and her death in 1970 remains elusive. Here is her story. The Psychogenealogist Pic of the Week (#26) - The Grzeskoviak Family at Mt. Olivet Cemetery in Detroit, MI. The Psychogenealogist Pic of the Week (#17) - A boy, his dog, and what I learned about mitochondrial DNA (mtDNA). This is a story of how I discovered the power of Facebook to help my genealogy research. I hope you find these tips helpful. We respect your privacy. Check your inbox to confirm.